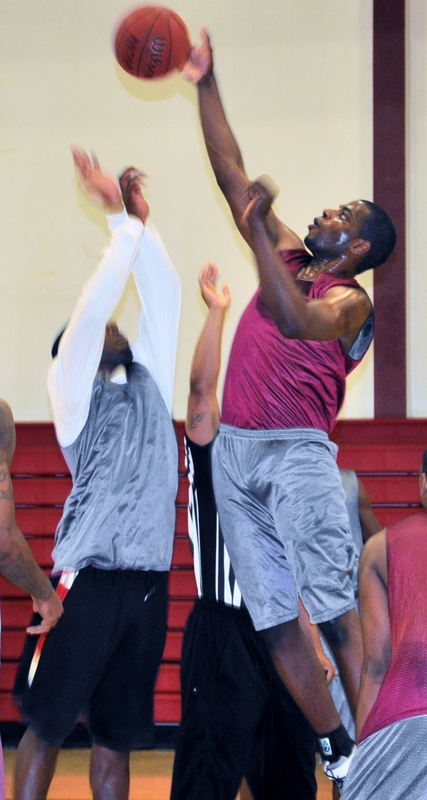 Dwan Caldwell, 6’8″, 235, power forward. Age 23. He looks like a man doesn’t he? He falls into my category of “Only In JUCO.” He has been out of high school for 5 years and has been working fulltime to make a living. Dwan has been dreaming about playing college basketball and has chosen Antelope Valley College as the place that he will start his dream. He is a dichotomy as a basketball player; he is very sophisticated in many ways and has rough edges in other ways. He will have to get back into the mentality of studying and that will be his challenge. He definitely works hard on the basketball floor and is a powerful man with soft hands, great feet, and a great attitude. Nice touch around the basket with a great will to succeed. Dwan has come a long way this summer. I believe he may lead the team in blocks and many of the rough edges of the spring has worn off. He can play at the 4 or the 5 and looks like he may be starting most games. His hours in the weight room have made Dwan look like a different man. All muscle now. He has been busting the books and with 7 more weeks before the season begins, its hard to say just how much better he can become. Dwan will definitely be a good start player, cant wait to cheer for him! You will get it! Ready for a really big season?